When I was a kid, Grandpa and Grandma would put in an order with the local turkey farmer in November for a “Christmas” bird, which would be picked up a few days before Christmas. We only had turkey once a year, so anticipating that special holiday feast was every bit as exciting to me as waiting for Santa to fill my sock on Christmas Eve. Even though turkey now appears on my family’s menu throughout the year, I still consider turkey to be a very special meal. I always keep an eye out for a turkey sale — an event that usually happens after Thanksgiving or Christmas, leaving unchosen birds in the supermarket bins at discount prices. Since some of the local stores where I shop only allow one “sale” bird per family, I visit several different stores to cash in on the savings. A sale turkey is delicious roasted whole or cut up and frozen for future meals. When I have a couple birds in the freezer, I know my family will be in for a whole lot of good eating. I like to buy a whole turkey frozen, then thaw it (or partially thaw it enough to work on) in order to cut it up, repackage, and put back in the freezer for a future meal. It’s not hard to butcher a turkey. The cuts are basically the same as with a chicken, only the turkey portions are much bigger. The birds I get on sale are always frozen ones. Before you can cut up a raw bird it must be thawed. You should never thaw a frozen turkey outdoors in the sun, on the counter at room temperature, or in hot water. These methods expose the thawed outer layer of the bird to bacteria-breeding temperatures while the inside of the bird may still be frozen. There are only two ways to safely thaw a whole turkey for refreezing. The easiest method is called the “defrost method” and it requires the longest amount of time and is the recommended method for thawing a bird that is intended to be cut up and refrozen raw into single-use packages. Keep the turkey in its original, unopened wrapper and place breast-side up on a rimmed tray large enough to prevent the juices (should the bag have leakage) from contaminating other foods in the fridge. It will take about 24 hours per 4 to 5 pounds of bird; a 10- to 15-pound bird will take 2 to 3 days to thaw, and a 20- to 25-pound bird will take up to 4 or 5 days (fridge temperature being 40° F or below). Although I have never tried it myself because of my small microwave, I have heard others say this method does a good job. If you wish to use this method, refer to your microwave manual for directions. 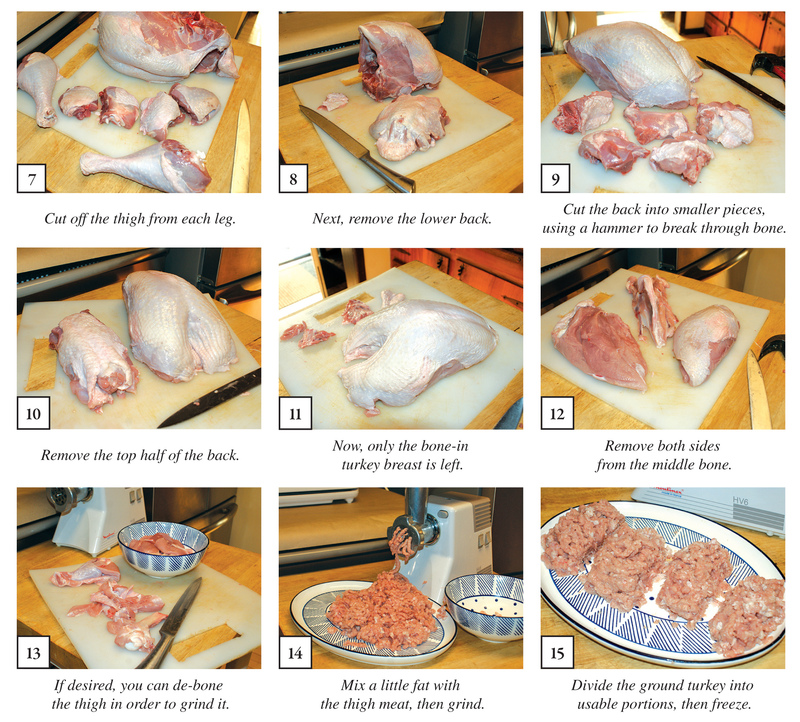 Once your turkey is thawed, it’s time to cut, portion, and refreeze it. Lay turkey on its back. Pull the wing away from the body and cut through the joint to sever the wing from the body. Repeat on other side. The wing can now be cut into three sections — the drumette, the middle section, and the tip. Slice through the skin with your knife in order to reveal the joint. Pull the leg away from the body until the socket pops out. Now cut between the joint to release the leg. Repeat on other side. Cut the thigh from the drumstick. 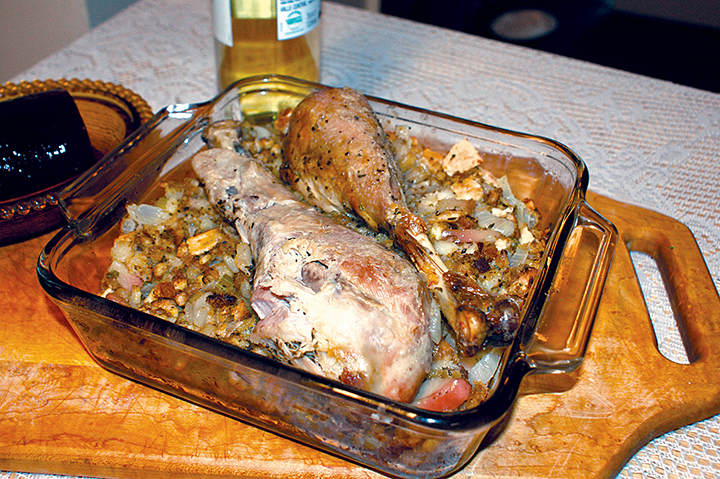 The thigh can be cut in half again, yielding four serving-sized pieces of thigh meat. 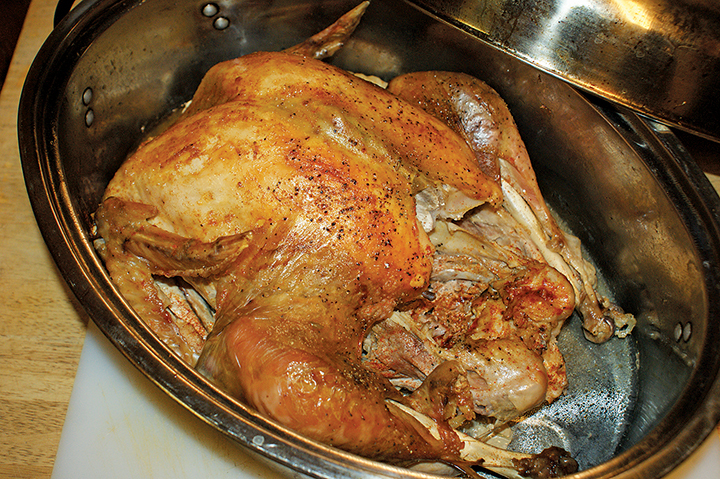 To remove the back from the bird, cut it off at the middle, directly below the bottom of the breast. If your knife will not cut through the bone, tap it gently with a hammer to free it. This portion of back can be cut into a couple smaller pieces (using the hammer if necessary to break through the bones) and saved for making stock. To remove the top half of the back from the breast, go in at the neck on both sides to free it. Cut this bony portion into smaller pieces and add to the stock pile. You now have a whole turkey breast with the bone in. To cut the breast in half to free it from the breastbone, place your knife as close to the breastbone as possible and slice the meat away from the bone to free it. Do the same on the other side to yield two prime pieces of breast meat. Boneless breast meat is very versatile. You can leave a portion of it whole for rolling and stuffing. Some of the meat can be sliced into ½-inch-thick pieces, across the grain, to yield cutlets which can be pounded thin for breading recipes. It can be sliced into “fingers;” cut into chunks suitable for making kebabs, stews, and creamed dishes; sliced into thin strips for stir-frying; or ground. If you wish to make some ground turkey, I find deboning the legs and thighs and adding a portion of breast meat is a good mix for grinding. I also like to add the fat for a juicier ground meat. Save the bones for the stock pot. Below are some of my favorite recipes for putting my stash of raw turkey meat to use. These are so good they disappear as fast as they hit the table. Makes 6 servings. Preheat oven to 400° F. Mix panko crumbs with Parmesan cheese in a flat bowl. Drizzle olive oil over top of crumbs, using enough to dampen all the crumbs. In another bowl, beat eggs with a fork. Working with one strip at a time, dredge turkey in flour, dip in egg, and roll in the crumb mixture, pressing to ensure it is completely coated. Place on a non-stick or greased baking sheet. Bake 10 to 15 minutes. Flip over and bake another 10 to 15 minutes, or until crispy and golden on the outside and meat is white in the center of thickest portion. To make the honey-mustard dip, mix equal parts (about ¼ cup) mayonnaise, mustard, and honey into a bowl. Stir in a squirt of lemon juice, a pinch of garlic powder, and salt and pepper to taste. These are saucy enough on their own, but if you wish to serve them in traditional fashion, set a little bowl of blue cheese dip on the side (recipe below). Makes 4 to 6 servings. Arrange wings on a baking rack over a drip pan. Pat with paper towels to dry. Season with salt, pepper, and garlic powder. Mix butter and hot sauce together. Reserve about half of the sauce in a separate container. Brush remaining sauce over turkey on all sides. Put 1 cup water in bottom of pan, drape wings loosely with foil. Bake in preheated 350° F oven about one hour or until meat is fork tender and cooked through at the thickest portion. 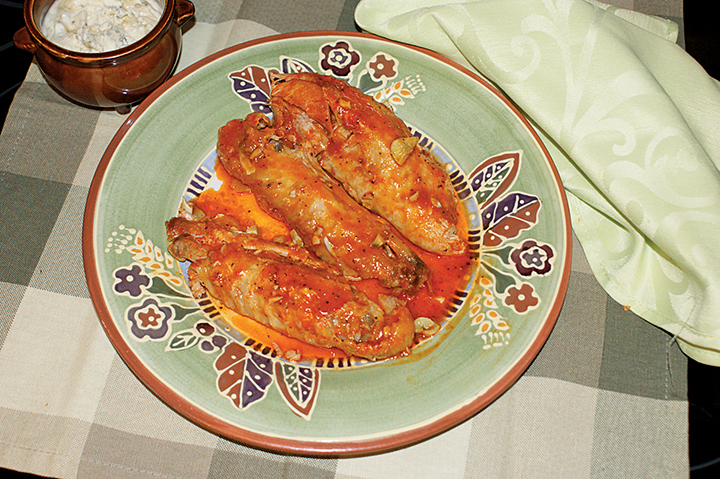 Remove from oven and pour remaining reserved hot sauce over top of the wings and serve with blue cheese dip, if desired. To make blue cheese dip, combine ½ cup mayonnaise, ¼ cup finely crumbled blue cheese, 3 Tbsp. sour cream, and juice of ½ lemon in a bowl. Season with salt and pepper. Grandma’s old-fashioned dressing fills the house with a festive aroma any time of the year. How many drumsticks do you need per person? At my table everybody wants a whole leg, but generally, a large leg should feed two. Serve with cranberry sauce, if desired. Season drumsticks and set aside. Melt 2 tablespoons butter in skillet, then sauté onion, celery, and apple until soft. Add the potatoes, seasoning, and stock. Heat to boiling. Stir in the cracker crumbs, then cover and let stand until liquid is absorbed, adding more crumbs if needed. Butter a baking dish with 1 tablespoon butter. Pat dressing into the dish and place seasoned drumsticks on top. Rub remaining butter over the legs. Roast, covered, in 350° F oven until tender and juices run clear when pierced with a fork and skin is browned. To check for doneness, a meat thermometer must register 165° F (away from the bone). Remove foil during the last 10 to 15 minutes of roasting in order to crisp up the skin. 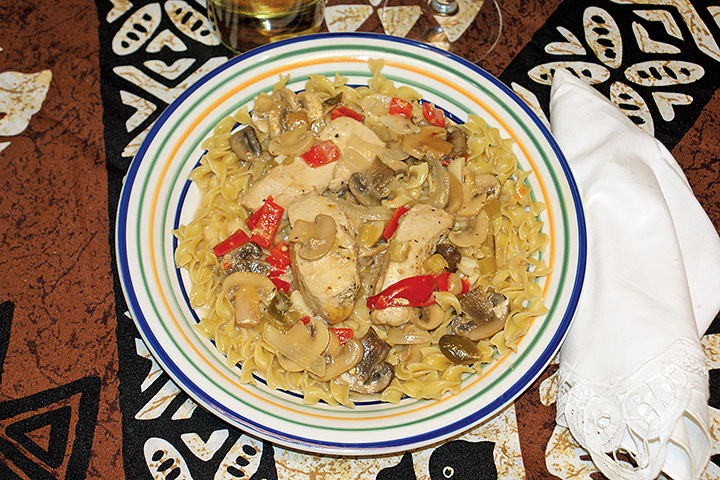 This dish can be stretched into a couple of extra servings if unexpected company shows up. There is lots of sauce and the meat can be sliced into smaller chunks to go around to all. Serves 4 to 6. Heat butter and oil in a large skillet, add the turkey and sauté until no longer pink. Add onion, garlic, celery, and peppers to the pan and sauté until soft. Add the mushrooms, herbs, stock, and wine. Cover and simmer 1 hour, adding more stock or water as needed to keep from going dry. When turkey is tender, stir in the cream (or soup) and the cheese. Heat through and serve. This makes 4 to 6 patties that are delightful served on a bun with all the trimmings. Mix all ingredients, except oil, in a bowl. Shape into patties. Place on a rimmed plate, cover with plastic wrap, and chill until frying time. Heat oil over medium heat in cast-iron or heavy skillet. Slip patties into the oil and fry until fully cooked all the way through and golden brown on both sides. This will take 8 to 10 minutes per side, depending on thickness. To make the meatballs, simply follow the previous directions, shaping the meat into small meatballs instead of patties. Fry until browned on all sides. Remove from heat, set aside. Empty 1 quart of your favorite tomato-based pasta sauce (homemade or store-bought). Add 2 cups turkey stock or water and bring to a boil. Drop in the browned meatballs, reduce heat, and simmer covered for one hour, adding a little more liquid if needed to achieve desired consistency. Ladle over cooked spaghetti noodles and pass around Parmesan cheese for sprinkling. Get out the wok and your favorite veggies. 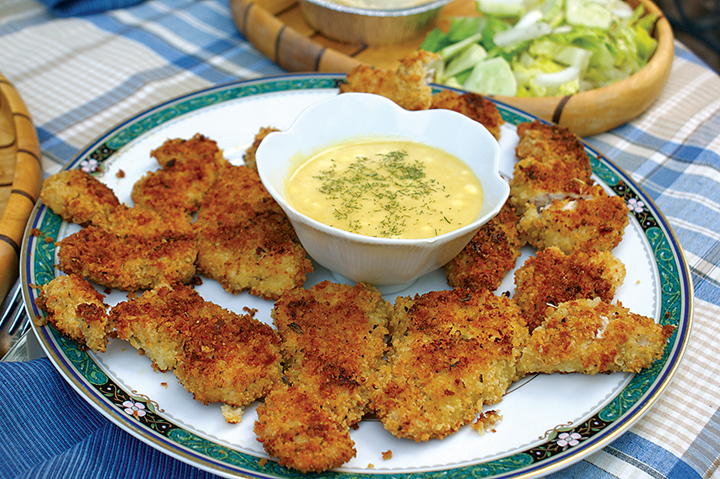 Serve with steamed rice or Asian-style noodles. Serves 4 to 6. Heat oil in wok, then add garlic and swish quickly. Add turkey strips and cook until no longer pink. Add the vegetables and stir-fry until tender. Sprinkle in sesame oil and soy sauce, then transfer to a platter, garnish with sliced green onions, and serve.